The Kyocera Mita FS-4000dn is a network printer optimized for office and business users who put a premium on speed, increased productivity and reliability for its printing needs. With enhanced speed output and volume production capability, the Kyocera Mita FS-4000dn is an inexpensive alternative to high-volume yet high-cost printers in the market, able to maximize performance and cost-efficiency that few printers, including high end ones, can match. The Kyocera Mita FS-4000dn boasts significantly high speed in print production, clocking at a rate of 47 pages per minute, almost double the speed output of Kyocera’s desktop printers. 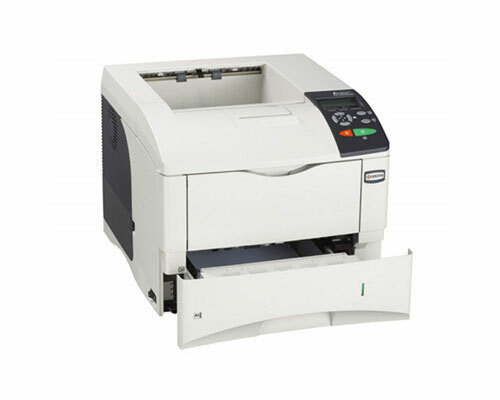 This output speed of the Kyocera Mita FS-4000dn should suffice moderate to high volume print production whether at home or in small or medium scale office, which are basically the niche of this workgroup printer. The Kyocera Mita FS-4000dn also boasts excellent resolutions at 1,200 x 1,200 dots per inch for its Fine 1200 mode, with other resolutions set at 1,800 x 600 dpi, 2,400 x 600 dpi and 600 x 600 dpi for its Fast 1200 mode. These resolutions are considered excellent, especially since high resolution is still available for fast printing and doesn’t necessarily affect the printer’s speed and efficiency in print production. The Kyocera Mita FS-4000dn is powered by a PowerPC750 500 MHz controller that allows it to fulfill its output speed efficiently and handle print jobs in a seamless manner. Standard memory for the Kyocera Mita FS-4000dn is significantly higher than normal desktop models, with a memory capacity of 128 MB that can also be upgraded to 640 MB for larger print volume demands. The Kyocera Mita FS-4000dn includes standard duplex option and network connectivity, supporting protocols such as TCP/IP, IPX/SPX, AppleTalk and NetBUI. Emulation and PDL support are also available via PRESCRIBE, PCL6, KPDL3, Diablo 630, IBM ProPrinter X24E, Epson LQ850 and Line printer functions. Font support includes 80 outline fonts for PCL6/KDPL3 and bitmap. The Kyocera Mita FS-4000dn also enjoys versatile operating system compatibility, being able to run and function under Windows, MAC, Novell and Linux platforms and distributions. Such versatility also allows the Kyocera Mita FS-4000dn to run its utilities with ease, such as the KM-Net Viewer for remote print jobs monitoring from a PC, KM-Net for Clients, the Kyocera Command Center, Direct PDF printing and other PRESCRIBE Utilities. Paper handling is also improved with the Kyocera Mita FS-4000dn, having multiple handling options for various printing needs. Its paper drawer has a maximum capacity of 500 sheets, while its paper feeder is able to take on up to 2,000 sheets. This also includes a face up tray that carries an additional 250 sheets, making the Kyocera Mita FS-4000dn more suited for increased volume in office print production. Given its approach towards a more efficient and cost-effective performance and production, the Kyocera Mita FS-4000dn only has a few areas where it can be found lacking. One significant part that the Kyocera Mita FS-4000dn can improve on is its first page output time. It may be considered quick by some users, but when compared to Kyocera’s Fs-1030 series, its 3 seconds slower to this desktop printer, not to mention that the FS-1030 is not exactly built for fast and high volume office productivity. Being a workgroup network printer, usability is a significant feature; however Kyocera’s display panel looks more like a downgraded version of what its desktop printers have. 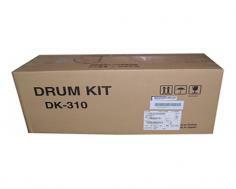 The Kyocera Mita FS-4000dn flexibility in handling paper types is also an issue, as it is not as versatile as its competition in being able to handle and support numerous media types. Review it: "Kyocera Mita FS-4000dn "
The Kyocera Mita FS-4000dn continues Kyocera’s trademark of providing cost-effective consumables, with high-yield yet inexpensive toner cartridges and other integral features. 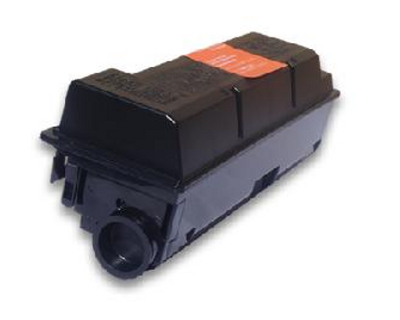 The Kyocera Mita FS-4000dn ships with a starter toner cartridge that only has a 10,000-page yield. Replacements however include a 20,000 page-yield at 5% coverage. These toner cartridges are certified for a durable lifespan, coupled with its low print costs that may even allow a user to recoup his budget for buying a Kyocera Mita FS-4000dn.